Pickup is This Thursday, November 14 from 10 – 6:00. Greetings Friends! Thank you for kicking off winter by taking home this year’s storage share! We love harvesting and prepping food in these colder months. Our northern growing and farm-fresh-eating season is so short it feels good to make it a little longer for all of us with big piles of hearty, yummy veggies. The work provides us with a last blast of soil, color and freshness before the depths of winter. Bright orange carrots and dark green kale, of all the beautiful things you’ll get this week, year after year these two bring more smiles to our faces than any other part of the farm at this time. We hope you find it satisfying and rewarding to cook and eat these hearty foods, and continue to support the farm. Although the regular season share is the mainstay of the farm’s financial stability, and for many of you, the mainstay of your summer produce supply, we hope the storage share is becoming a valuable part of our role in providing food for the community, and will be for years to come. Not everybody gets as excited about the sweet heartiness of fall food as they do about the juicy fruits of summer, so we appreciate your passion for good farm food extending into fall and winter! Seems like we haven’t stopped picking since the regular share pickups ended a couple weeks ago….except for the one snow day which gave us some time to catch up on office work! We only got about a half-inch, which is good since we had more carrots to pull from the ground. We were back to picking a day later, and the barn is brimming with root crops and cabbage, and garlic and onions. 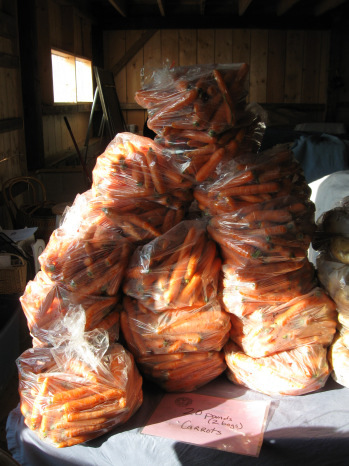 The 1,500 or so pounds of winter squash are cleaned and staying warm in the greenhouse, and the potatoes are bagged and ready to go, waiting in the basement. The hardy crops that we’d been leaving in the field have been getting sweeter and sweeter — kale, brussels sprouts and leeks — but now with this frigid cold front the only thing left out there is the kale. We harvested the sprouts and leeks, just to be safe, good thing since it was 14 degrees at 6pm Monday night! Thanks to the soil for growing such awesome food! We hope you have a great winter, eating and being well. Carrots — 20 lbs — Sweet and juicy, definitely the best carrots of the year. They’ll be in two separate, ten-pound bags. The bags are perforated with holes and work great for long-term storage. Easy Storage Tip : Fridge. Potatoes — 8 lbs — The variety is Kennebec, which stores well and is a good all-purpose spud. We aim to have ten pounds for everyone but we had to cull over a third of the harvest due to “greening” in the field. Kennebec is very prone to greening, from sun exposure, in this case from not being covered by enough soil, due to inadequate cultivation (ie operator error) or excessive rainfall (ie 6″ in 2 hours this past July.) Note: Kennebec is also prone to greening in storage, so be sure they are kept in a completely dark place. Easy Storage Tip: Dark, cooler than room temp, but not in fridge. Mixed Roots — 10 lbs — You get to mix and match a bag of beets, parsnips, celeriac, radishes, purple carrots, and maybe another surprise or two. We’ll have those same perforated bags you can put them in for long-term storage. Easy Storage Tip: Fridge. Winter Squash — 5 — Butternut plus a few pie pumpkins available. Should keep very well into January, declining after that. Easy Storage Tip: Countertop or tabletop, but for longest storage put a few in the basement or cool closet. Brussels Sprouts — 2 stalks — Good sprout year. Easy Storage Tip: Fridge for 1-2 weeks. Cabbage — 1 or 2 — We’re glad some managed to hang on even though they matured a month ahead of time! Easy Storage Tip: Fridge. Onions — +/-4 lbs — The yellow ones store very well, until the sun shines again, March or so. Easy Storage Tip: Basement or hanging basket. Leeks — 3 or 4 — Depends on yields, we’ll pick this week. Think of leeks like mild, glamorous onions. Our favorite use is in quiche, with red peppers and spinach or kale (fresh or frozen.) Leeks also freeze well, chopped raw in a bag, they can keep a month or two but then may start losing flavor. Easy Storage Tip: Fridge. Garlic — 5 heads– These should store until January or even February. Normally we have extra garlic for sale now but this year we’re sad we don’t — we had tons of orders and requests earlier in the fall, so this 5 is all we’ve got left! Easy Storage Tip: Countertop or hanging basket. Kale — 1 clear bag — This is far and away the sweetest kale of the fall, it’s indescribable. If you’ve ever wanted to convince someone you love (including yourself) about the wonders of kale, now is the time!! It might seem limp but will still hold up to two weeks in the fridge — the deep freezes can make it limp or wilty but it still hangs on. Sweet Potatoes — 2-5 pounds — Yields were low for 2 reasons : mild and cool year for a heat-loving crop, and some were planted late due to miscommunications with the excavators working on that part of the farm. We’ll have them clean and dirty, your choice. The clean ones are reliably good for two to three weeks. The dirty ones will store longer, maybe 1-2 months. Easy Storage Tip: Basement, 60°, if it’s not 60 then eat within one month. Dried Herbs — Your choice of 3 bunches — Oregano, Thyme, and/or Sage. Easy Storage Tip for entire share: Keep about half of everything in your fridge for eating all winter and then have a soup-making day with the rest of the share and freeze soup to enjoy all winter. There are a lot of soup recipes in the hard copy recipes available in the barn. We’ll also have copies of more detailed storage info available. Kale — We’ll have some in the barn but there’s more out there, help yourself! There’s the planting next to the greenhouse, and south of that, a bigger planting. At this point you can pick every single leaf, literally, there’s no need to leave the small ones since we’ll be tilling it in before the snow covers the field. For herbs, thyme, oregano, sage. If you can’t make it on Thursday please call or email, and we’ll make arrangement to get you your share. Guess the Blue Hubbard! This year we got a few nice ones, so we’ve saved out the biggest one and it will go to the closest guess. We have no poker face, so we won’t be weighing it until after everyone guesses! It will be on the sign-in table, a bumpy blue-grey dinosaur-looking-squash, and we’ll provide a few recipes to go with it. It makes an awesome harvest feast. Bring a Sturdy Box — If you like, a box or tote may be the best way to carry this to your car. It’s a lot of food, and heavy. Much of it is already bagged for you, but it is several bags, plus the loose crops. We’ll have a few paper bags but if you have some it’s a good idea to bring those too. We can help you carry or roll it to your car if you like, feel free to ask. Storage Details — We’ll have hard copies of detailed storage needs, lengths, and suggestions for each crop, help yourself. Lost and Found — There’s some nice stuff in there, near the sign-in table. Share Pickup Hours — THIS THURSDAY, November 14, 10:00-6:00pm. Here are 3 new recipes. We’ll have a couple pages of other great “keepers” too, available in the barn. Carefully peel and clean the squash and dice it into very small cubes. Put the diced squash in a heavy-bottomed pot and cook with a few whole leaves of sage, salt, and 1 cup of the chicken stock. Cook until tender, but not too soft, about 5 to 10 minutes. Meanwhile, chop 6 sage leaves fine and cut the onion into small dice. Heat the rest of the chicken stock and hold at a low simmer. In another heavy-bottomed saucepan, heat 3 tablespoons of the butter, add the chopped sage, and cook for a minute or so; add the onion and continue to cook over medium heat until it is translucent, about 5 minutes. Add the rice and a pinch of salt and cook over low heat for about 3 minutes, stirring often, until the rice has turned slightly translucent. Turn up the heat and pour in the white wine. When the wine has been absorbed, add just enough hot stock to cover the rice, stir well, and reduce the heat. Keep the rice at a gentle simmer and continue to add more stock, a ladle or two at a time, letting each addition be absorbed by the rice. While the rice is cooking, sauté the remaining sage leaves in butter until crips. After 15 minutes, the rice will be nearly cooked. Stir in the cooked squash, the rest of the butter, and the cheese. Continue cooking for 3 to 5 minutes. Taste for texture and consistency, adding a little more stock if needed. Adjust the seasoning. When done, serve in warm bowls and garnish with extra cheese and the sautéed leaves. Heat the oil in a large soup pot over medium heat. Add the onion, celery root, carrot, and garlic, and sauté until the vegetables are slightly tender, about 3 minutes. Add the broth, tomatoes, cabbage, beans, rosemary, and thyme. Bring to a boil, then reduce the heat and simmer until the vegetables are tender, about 30 minutes. Return the soup to a boil. Add the pasta and boil gently until the pasta is tender, about 10 minutes. Season with salt and pepper. Serve hot. Kitchen note: Like all soups that contain pasta, this will thicken on standing. Thin with additional broth or water if needed. Preheat the oven to 350˚F. Grease a 9- by 5-inch loaf pan and line with parchment paper. Whisk together the flour, baking powder, baking soda, cinnamon, salt, and nutmeg in a medium bowl. In a large bowl, combine the oil and sugar and eat until fluffy. Add the eggs one at a time, beating well after each addition. Stir in the pumpkin and milk. Add the flour mixture and stir just to combine. Fold in the chocolate morsels. Spread the batter in the prepared pan. Bake for about 1 hour 15 minutes, until a tester inserted in the center of the loaf comes out clean. Let the bread cool in the pan on a wire rack for about 10 minutes. Invert onto the wire rack, remove the parchment paper, and let cool completely.